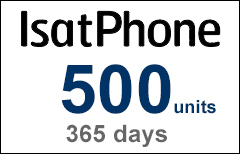 The IsatPhone 500-unit airtime voucher refills your Inmarsat IsatPhone prepaid account (SIM). Returns and Cancellations. You can request a cancellation only if your voucher has not yet been loaded to your Inmarsat account. Prepaid vouchers that have been loaded to the satellite account are NOT returnable or refundable, no exceptions! You can use this prepaid voucher only if you have an Inmarsat IsatPhone account (SIM) supplied and activated by SATTRANS. We cannot reload minutes on other providers' SIM-cards. If you don't have an account with Sattrans, you can always purchase and activate a new IsatPhone Prepaid Plan.